Good morning, lovelies! So, the day is here–we are kicking off the 3-Day Green Smoothie Cleanse. For some of us it is for weight loss, for some it is to cleanse our internal organs, but for all it is to feel better. First thing this morning I weighed myself in–this cleanse is a little bit about weight loss for me. Although I don’t have too much too lose, I felt an extra pound creep up on me, and it MUST go. I know it will be gone by tomorrow morning for sure ;). Then I headed off to the kitchen and made enough smoothies to last hubby and I all day long [he decided to join the fun too ;)]. I made green smoothies for AM [morning] intake and PM intake. Why did I have to label them? Well, the raw cacao nibs that I used in the morning recipe, would not be the right thing to eat before heading off to bed ;), since there might not be any sleeping done if that were the case. 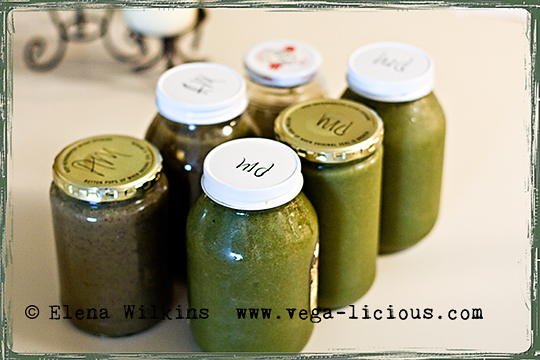 Since while I was making the smoothies hubby was doing Yoga X, I decided to name both recipes after Yoga poses. Blend ingredients 1-7 until smooth; then add spinach and blend, at the end add blueberries and blend them in. Refrigerate what you don’t eat right away. Blend ingredients 1-7 until smooth; at the end add strawberries and blend. Refrigerate what you don’t eat right away. As you can see I am set for the day with my food intake. How did you prepare?